I was so impressed with the Zeta 2 design when I built my floppy controller for the RC2014 that I decided to go ahead and build a Zeta V2 as well! As you’re probably aware if you’ve read my previous blog posts, one of my recent hobbies has been retrocomputing, building computers based on the techniques of the 1970s and 1980s. Most of the projects I’ve built have been based on the RC2014, but I came across the Zeta 2 and decided to give it a go as well. The Zeta 2 is designed by Sergey Kiselev. 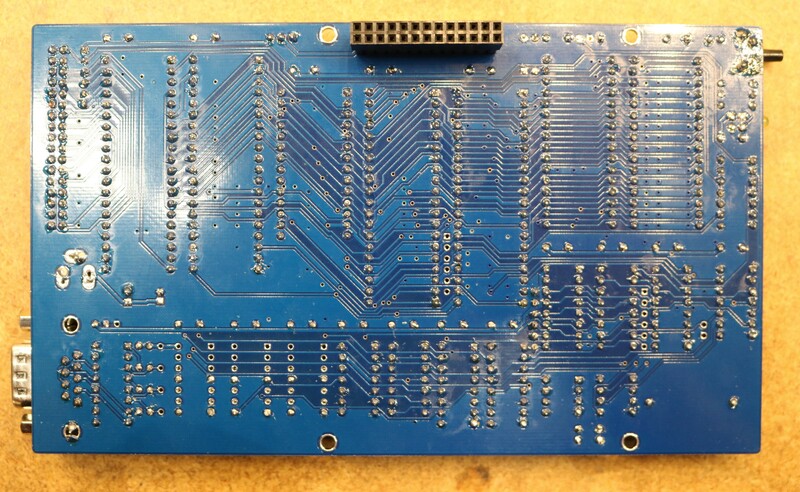 There are PC-Boards available at the Vintage Computer Forum for $20 each. 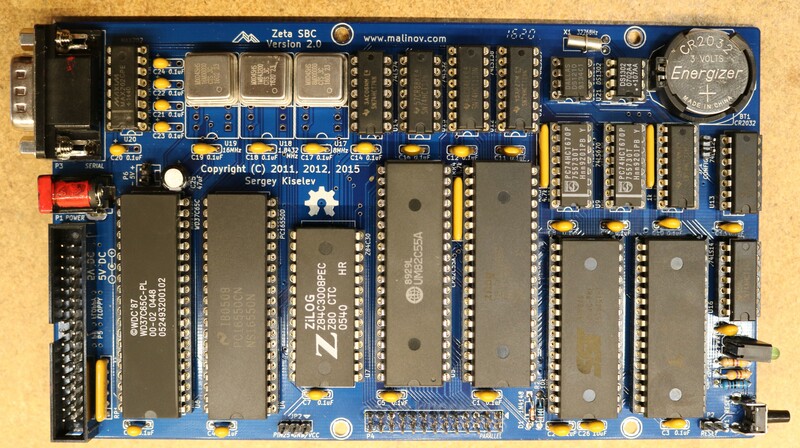 The Zeta 2 differs from the RC2014 in that the Zeta 2 pretty much gives you everything you’re going to need (CPU, Parallel IO, Serial IO, Storage, Ram, ROM, clock, etc) all in a single PC-Board. As such, it’s relatively easy to assemble a fully-functional CP/M computer and has a working CP/M distribution that runs right out of Flash ROM. If you want to get a fully functional CP/M computer up and running quickly, the Zeta 2 is a great way to go. Most of the ICs are easily sourced from places like Digikey or Jameco. A few of the more unusual ones, like the WD37C65 floppy controller, you may have to find at a site like eBay. Make sure to plan out your part acquisition accordingly (if you order some chips from eBay, note that suppliers are often in China and it may take a few weeks for parts to arrive). The ParPortProp uses the Parallax Propeller micocontroller, a relative modern chip, so it diverges a bit from what we might consider classic retrocomputing. The Zeta 2 is still your “computer”, but the ParPortProp is acting as a terminal attached to the computer. This lets you connect a keyboard and monitor up to your Zeta 2, giving you a standalone computer than you can directly interact with. The biggest disadvantage of the ParPortProp is the amount of PIO that it consumes. If you’re like me, and you like interfacing lots of things to your projects, then you might find the remaining 8-bits of PIO somewhat unsatisfying. The ParPortProp is completely optional though. I really enjoyed building this kit. I was able to get CP/M up and running almost trivially. CP/M runs out of ROM so even if you don’t have a storage subsystem handy (floppies, SD Card, etc), you still have a fully functional computer. Scott, thank you for this nice write up and the excellent video! Where can one find the boards for the zeta2 and the paraport? Are either the floppy or SDcard directory structures compatible with DOS/Windows? In other words could I write a text file on my Windows machine store it on a floppy or SDcard then move the media to the zeta2 and read the file? I am about to embark into retro computing, coming from an Arduino background. I have one part that puzzles me, as I am new to this. How does the ROM get loaded with the BIOS and CP/M? I remember back when I was little I had a Tandy 1000 RL which had MS-DOS 3.22 and Deskmate loaded into ROM but never knew how it got in there. ROMs are usually programmed at the factory. For retro-computer builds, we typically use EPROMS (Erasable Programmable Read Memory) or Flash, which we can easily program, erase, and re-program ourselves. You’ll want to pick up a programmer. Check for a TL866CS on eBay. thanks for this good guide. One question, Where can I get the 2×13 female socket header(P4 connector) with such long pin? it seems not very common to find it. Try searching for “stacking header”. I generally have a pile of them for various raspberry pi projects. 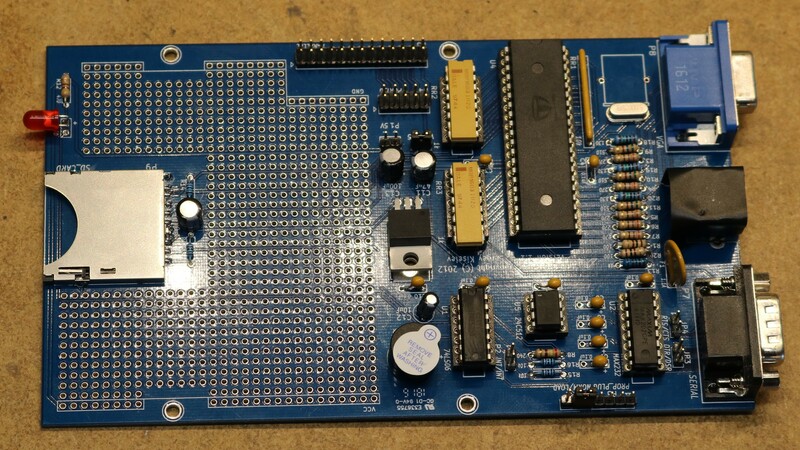 Where can I get a parportprop board? I built the zeta2 and its great but I would like to add the parportprop. Anyhow, Thanks again for your posts and videos!